To bring new customers in and to bring your existing customers back more often to watch soccer matches, you have to let them know you will have the games they want to watch. And you have to let them know when they are on. 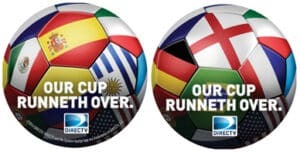 Through their MVP Marketing program, DIRECTV is making the promotional materials you need to make your business the 2014 FIFA World Cup HQ available for FREE or at a deeply discounted prices. 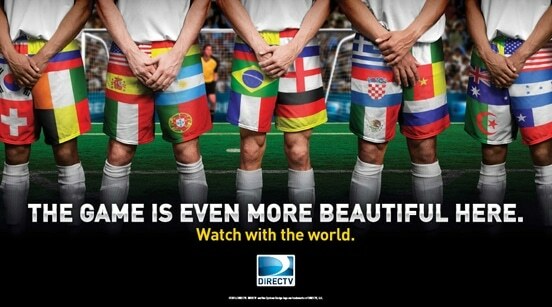 Its All About Satellites is your DIRECTV for Business dealer. 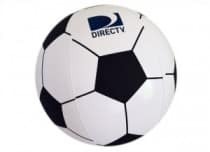 Whether you want the World Cup available in your waiting room, your break room or kitchen or available for your bar or restaurant customers, we are your source for DIRECTV for Business. As part of the DIRECTV MVP Marketing program for bars and restaurants you can get Banners, Posters, Coasters, and more for FREE or at steeply discounted prices. To Promote the World Cup before the Action Starts. Order your World Cup Promotional Kit Today! 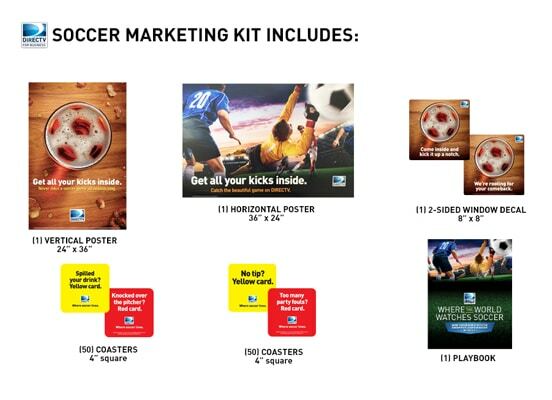 Even after the World Cup is over, the DIRECTV MVP Marketing has free and deeply discounted promotional materials including the Soccer Marketing Kit. In the US, Soccer ratings on TV have been steadily climbing since 1996 and in 2012 soared to heights ESPN had never experienced before. MLS ratings are growing every year and each World Cup match attracts four times as many viewers as the Super Bowl. With 8 MLS matches per week and 64 World Cup matches, that’s a lot of thirsty fans. and Soccer, the Fastest Growing Sport in America, in your Bar or Restaurant.